wearing: top c/o Club Monaco; denim jacket c/o Cheap Monday; shorts c/o Romwe; bag & shoes - Vintage; scarf- American apparel; Sunnies - Urban Outfitters. Loving this look! All of your pieces look so wonderful combined! Your head scarf is especially nice! 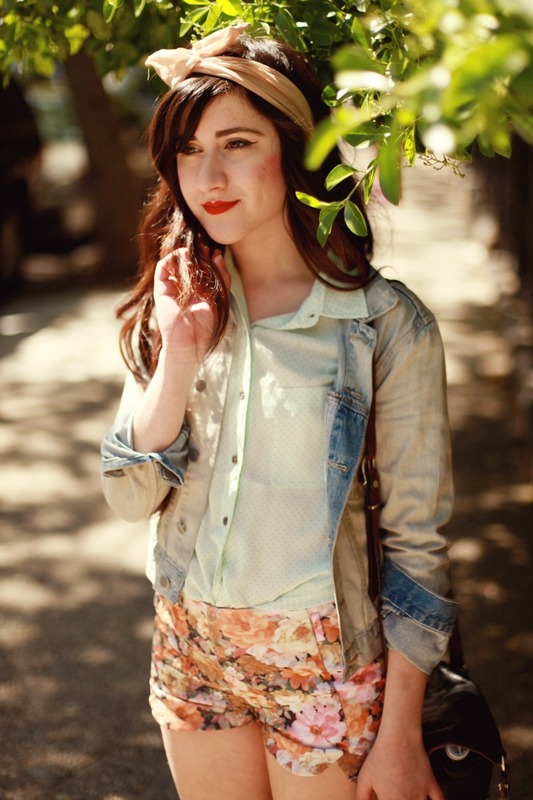 you look amazing <3 i feel summer when i check those photos <3 your shirt is so lovely & floral shorts aw! Adorable look! Love the shorts! cutie patootie! love those floral shorts and those sunnies! looks like NYC is finally heating up! Such a beautiful romantic and retro look! So glad the sun came outfit for you, it's pouring rain here! I can't wait until I can wear cute floral shorts like that again! Beautiful! Love the colors and the floral print! I love your shorts and flats! You look divine! Really love it! I looove the headband! Very nicely mixed with the shorts and sunglasses. Love your outfit once again! Great summer outfit! The shorts are so adorable! You look so cute! I love those shorts. This outfit is adorable. I love the denim jacket. Ah hooray for sunshine! I love your little shorts, so cute! Love the shorts and the matching turband is adorable. Love your floral shorts and sunnies!! this is such a sweet outfit and i love your sunnies! All is awlways well when the sun comes out to play. Love the shorts. Those SHORTS! loving your style.enjoy the sunshine! These are such gorgeous pictures! And your shorts are so perfect! So adorable, as always! Those shorts are great. Love to see this post :) Thanks for sharing this! maybe we could follow each other on Bloglovin and/or GFC, Facebook? I love how you styled those floral shorts! very pretty! I like your shorts.